Home » Articles » CollectionDX "The Show"
Every other week (or so) the CDX Crew cover the best in Toy News, Reviews and Commentary. Roses are red, Romeo is Blue, JoshB said Shizzle, and Gaz did too. Jmann fills in for JoshB as he and Gaz discuss the latest news and reviews! SEASON 2 EPISODE 3 - Official Knock Offs? JoshB and GazBot discuss the latest news and reviews! Plus we unveil the overhauled opening graphics, courtesy of Jmann! THE COLLECTIONDX SHOW IS BACK. Kind of. Join JoshB, Chachipower, and GazBot as they discuss the latest news and reviews! JoshB and Chachipower talk about this week's news and reviews! Episode 126 - Beast Kings, Museums, and the Italian Mighty Orbots. JoshB and Phil Reed talk about this week's news and reviews! JoshB and Chachipower dish on NYCC and this week's news and reviews! JoshB and Ben Leach talk about the latest News and Reviews, along with a discussion of American toylines you may not have realized were Japanese! JoshB and VZMK2 discuss this week's news and reviews, along with a hearty discussion of moe! Phil Reed joins JoshB as they talk about this week's news and reviews! JoshB and guest Michael Bucci talk about the latest News and Reviews! JoshB and special guest David White talk about the latest News and Reviews! Josh Reed and Luis Contreras sit in for JoshB and talk about this week's news and reviews! Josh and special guest David Lockwood talk about this week's news and reviews! Josh and Andrew shed some light on this week's news and reviews! Josh is all by his lonesome (sort of) as a new era for the show begins. The weekly recap of the news and reviews as posted to CollectionDX.com with Josh and Adam. Josh is back from London and we catch up on all the Star Wars news, compare lightsabers and do the usual news and reviews roundup from the site. It's a heavily nostalgia driven show today with Josh and Adam. Your weekly gathering of the toy nerds begins now, this time tech issue free! Josh and Adam talk the week in toys and collectibles. This time with 200% more echo! The toy news round-up for the week with Josh and Adam. NOTE: Show was only recorded in Standard Def due to an issue in the switching software. We will be back to proper HD next week! The weekly gathering of the toy geeks with Josh and Adam. It's the weekly convening of the toy geeks with Josh & Adam. This week Josh and Adam get together for the usual news and reviews. It is your weekly dose of all that's cool in the world of Japanese robots, sci-fi toys and action figures with Josh and Adam. We get the chat room completely drunk and as usual your feedback. Josh and Adam go over the ToyFair 2014 news. This week we launch our Patreon page to support the growth of the show Then we do the usual news and reviews for the week. This week Justin Robert Young sits in for an absent Josh and we talk Super Mario, the return of TakaraTomy ARTS line, an Ashley Wood redesigned Iron Man, a Nendoroid Spider-Man, a dual mode Optimus Prime, Stax, Sir Trollahad and the Sentinel release of the Powered Suit from Starship Troopers. This week we celebrate our 100th episode! We do our usual news and reviews and then in our Blind Boxed segment we take live calls from the viewers! Shenanigans ensue. This week it's Mighty Morphin Power Rangers, the ugliest Star Trek action figures you will ever see, an 18 inch tall Gypsy Danger, Inhumanoids and Visonaries. Happy New Year! This week we chat about Space Giants (aka Ambassador Magma), an actual Danboard robot, an super cute Tetsuijin 28 FX, Striker Eureka, RIO:bone Tripod, Masterpiece Smokescreen and the return of Roboforce, kind of. Hope you had a great Holiday! It's the usual round-up of news and reviews for CollectionDX.com for the week ending 12/27/2013. In Blind Boxed we get into a spoiler filled chat about the "Time of the Doctor." After a short hiatus we are back at it! THis week we talk Dynamite Action GK Reideen Resin Kit, ThreeZero Mazinger Z, Figma Levi, Alien ReAction Figures, Noisy Boy, Battle Damaged Gipsy Danger, Biollante and a bootleg calling itself Gaiking. This week we talk Big Dai X, Dino Getter Robo, Bio-Mechanical Ordnance Gestalts, Ggrapptikk, OMFG! Series 3, more Doctor Who geekiness and Josh rants about YouTube changes. This week we beat two topics to death; New York Comic Con 2013 and Josh's review of the all-new Vehicle Voltron. Enjoy! This week we talk a K-9 Talking Plush, a new Dougram Model Kit, Danguard A, a new and affordable US released Mechagodzilla vinyl and the Lensman Britannia II. This week we talk about western properties coming out in the S.H. Monsterarts line, more of Josh's Raideen obsession, the Patlabor TV series, Power Lords and the first die-cast release from SEN-TI-NEL CO,.LTD, the Blodia. 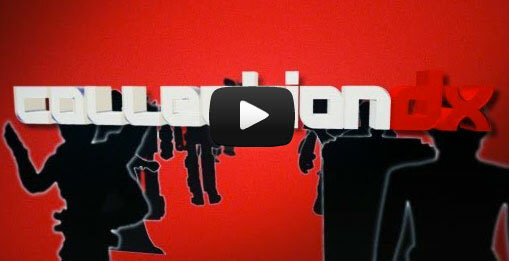 Josh and Adam reconvene to discuss the latest news and reviews as posted to CollectionDX.com. This week's highlights include a life-size Kenner Stormtrooper, Dynamite Action New Getter 1, Shocker Combatman, Blocker IV Boss Palder, Jungle Extraction Dutch and Masterpiece Soundwave. This week we are joined by Poe Ghostal to talk about about this weeks Super Review Wars DX. Back at this week, Josh and Adam talk the latest news and reviews as posted to the site. We are still in recovery mode from the East Coast Chogokin Summit but still manage to get a show out this week for you! Josh is back from camping, Adam get a new day-job, we talk about toy-collecting apologists, take a sneak peek at Transformers 4 and of course we talk the latest news and reviews as posted to the site.